Hungry Kat and her Cat. We eat. We travel the world. We sleep. 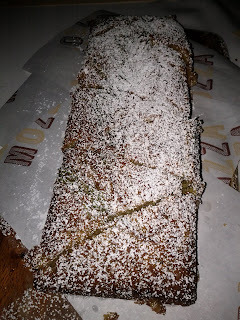 Tomato worship is in full force at Mozza's Scuola di Pizza Tomato-themed dinners right now and it's so good it has inspired me to finally write again! Many varieties of heirloom tomatoes are featured in this multi-course dinner and all the tomatoes are from the legendary Chino Farms, just north of San Diego. I went with three friends yesterday, one is a tomato monster who has practically adopted tomato as her middle name, and we all loved the dinner. I'm not a tomato monster but I do love tomatoes at the peak of the season, fresh from the farm. Every mouthful bursts with layers of complex savory, sweet and acidic fruit flavors. If you only eat the supermarket varieties that look like a tomato, then you haven't had a great tomato. That can easily be rectified by visiting your local farmers market this month or next month (and maybe read this too and you'll never want to waste money on a supermarket tomato again). Better yet, call Mozza right now and get yourself into their Tomato dinners before the season is over and Mozza moves on to its next theme. This is a salad a meatatarian can dream about. 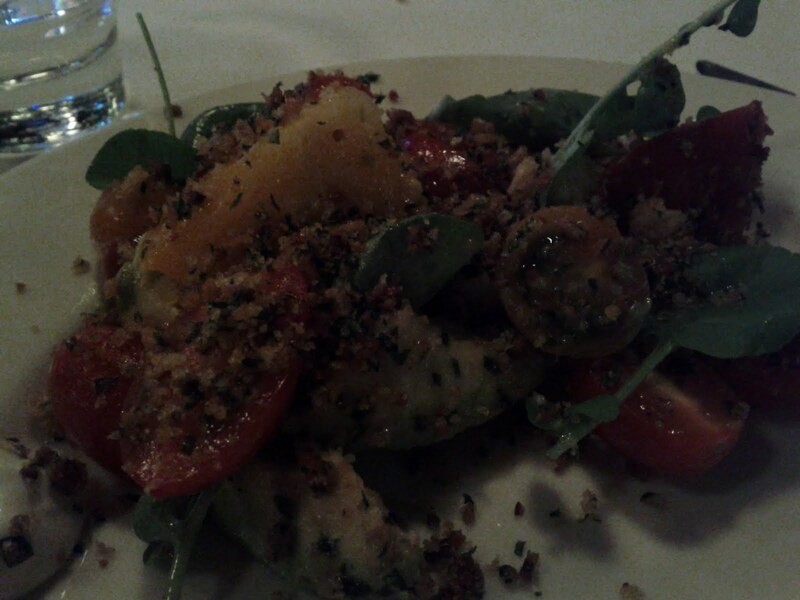 Different heirloom tomatoes are tossed with ripe avocado, watercress, a bit of aioli and topped with the most amazing bacon breadcrumbs. Every bite of this deconstructed BLT was rich and savory, almost like eating tomato "steak." I sent this picture to my boyfriend and his response was "I hate you with a fiery passion." Poor thing, he loves burrata and had to work late and I went to this dinner with friends. (I did make it up to him by buying some burrata to-go for him.) 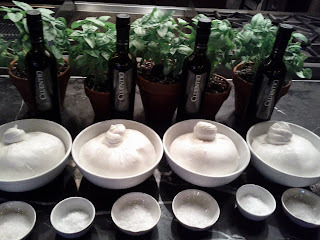 Di Stefano's burrata cheese is amazing and this local dairy makes this giant ball of burrata especially for Mozza. We couldn't finish the whole bowl even though eight of us shared one bowl and my friend and I took second helpings to eat throughout the rest of the meal. This burrata course was especially fun to eat because it was interactive. 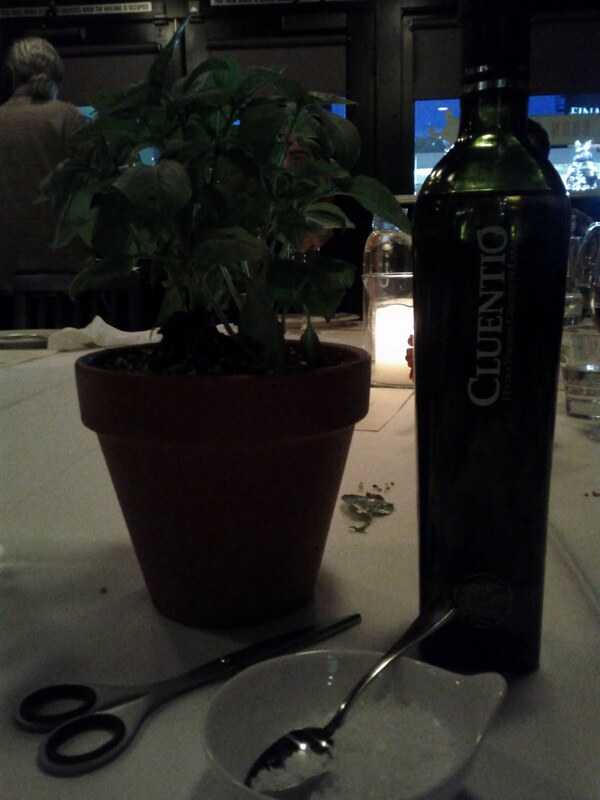 Four of us shared a potted basil plant and we could snip off as much fresh basil as we wanted for our burrata. What a great idea! Can't wait to steal it for my next dinner party at home. I layered a giant spoonful of burrata on a slice of perfectly toasted bread and two thick slices of Cherokee Purple heirloom tomato and then I sprinkled it with some sea salt, the fresh basil and extra virgin olive oil. This open-faced sandwich was about the size of my face. The sweet creaminess of the tender burrata melted in my mouth instantly and swirled with the savory, meaty flavors of the Cherokee tomato. The subtle hints of salt, basil and oil enhanced every creamy, savory bite. I was in heaven! Years ago, I ate the best spaghetti I've ever eaten and it was when Scott Conant was still cooking at L' Impero in Manhattan. I never forgot the taste of that spaghetti and he left L'Impero and now of course, owns the Scarpetta empire which still makes that wonderful spaghetti. 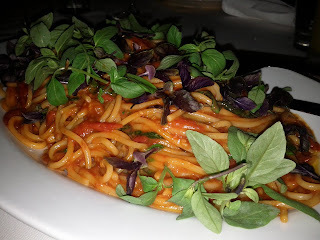 However, this spaghetti at Mozza can give Scarpetta's famous spaghetti a run for its money. 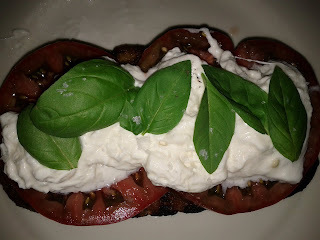 Frankly, this one is so good, I think it has finally taken Scarpetta's place in my heart. The chef slow-cooked tons of cherry tomatoes with garlic. Before the pasta is cooked, he takes it out and drops it into the sauce to cook together and the starch from the pasta gives the sauce a nice velvet thickness that coats every surface of the pasta. This spaghetti tastes really good combined with a bit of creamy burrata too. Having been to many Scuolo di Pizza dinners at Mozza now, I know that I can easily be stuffed by the fourth course. I thought I had wisely avoided eating too much of Nancy Silverton's amazing foccacia bread (only 1 slice this time) to save room but then I was greedy with the burrata and spaghetti so by the time we got to this wonderful veal dish, I had to get up and walk around. Boy, it was worth it though. Nothing makes steak better than tender baby cows. This blew our minds. Olive oil on gelato? Tomato on top of my gelato? 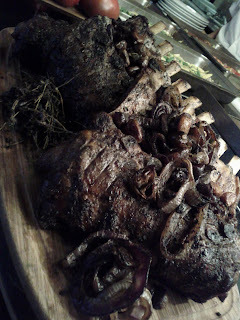 After tasting it, I threw my skepticism out the window and declared it awesome food genius! Mozza often serves gelato at these dinners and this one is easily the creamiest, richest gelato I've ever had. 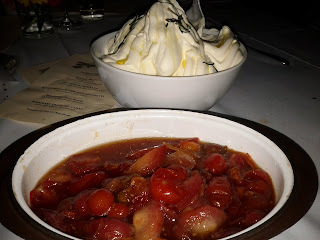 The most impressive thing about this dessert is the sweet tomato plum compote - great texture and perfect balance of plum sweetness with the fruity tomatoes. This is another favorite dessert often served at Mozza. This light cake went very well with the rich gelato and sweet tomato plum compote. You can't go wrong with these themed family-style dinners at Mozza. It's the best $75 you will spend on amazing food in this town. I love the casual atmosphere too. Chef Chad Colby preps the food in an open kitchen right behind the communal table and he's always happy to chat with diners about his ideas, the ingredients and how he cooked each dish. The service is attentive without being too fussy or stuffy and if you're open to chatting with the diner next to you, the chance is high that you'll meet someone interesting and fun to talk to. And congratulations to Chef Colby for winning Cochon 555, the heritage pig competition in LA back in May! So, while you're reserving your tomato dinner, reserve a spot for Chef Colby's whole-hog dinners too. Trust me, you'll thank me later.